In any carnival, village fair or circus ground you cannot miss the cry of the sara vita man. Dressed in outlandish attire, green pants and red coat, a peaked hat and bells at his ankles, he carries a tray of sara vita. The tray is made secure by a tape that goes round his neck. At one end of the tray is a carbide lamp which lights up his wares at night. What is sara vita? Bulath ‘vita' is a chew of betel, but sara vita is more or less a hybrid — a generous helping of freshly grated kottapol (dried coconut kernels or copra) sweetened, dyed in bright colors, with added spices, cardamoms, nutmeg, cloves and ingurupiyal. All these are deftly wrapped in a betel leaf to make a sara vita. But what is betel? We call it bulath. Hindus call it pan. To both parties it is sacred. Legend tells us that betel grows in the world of the Nagas — mythology tells us that the Nagas are celestial beings who can change their appearance to that of cobras. 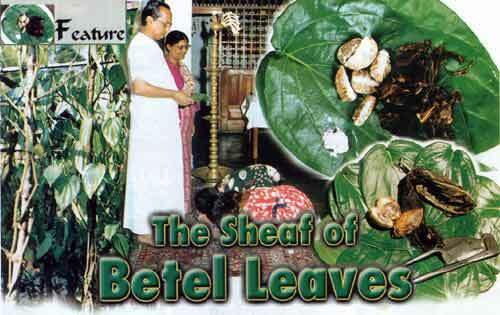 Betel grows in the Naga realm and is brought to earth when the Nagas come to worship the Sacred Foot Print on the nights when kadupul flowers are in bloom. People have a habit of nipping off a bit of the stem and the tip of the betel leaf because of the belief that the cobras teeth would have bitten into these parts when they carried the betel to earth — of course there is a mixing up of the celestial Naga with the mundane cobra, but that's how legend lives on. Reference to betel goes back to the Vedas. 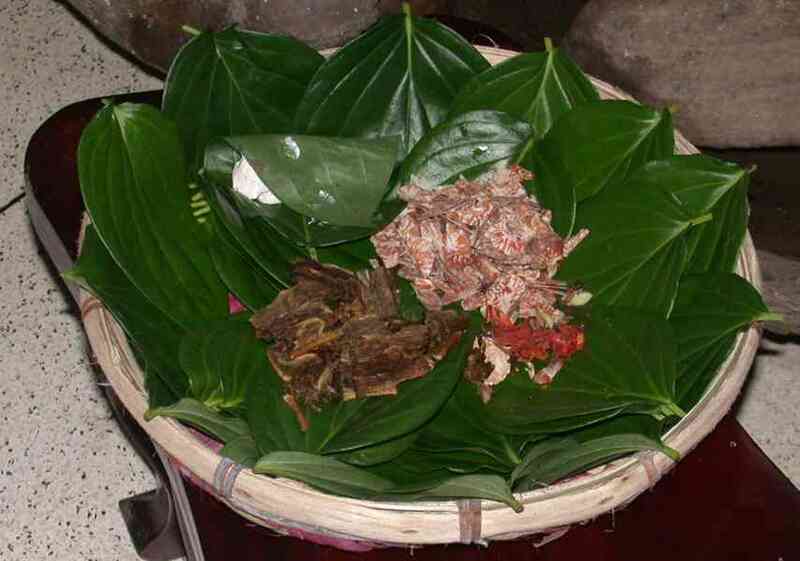 Here as in subsequent literature, betel is regarded as sacred. The first offering to deities is betel. The first offering by a child to his guru is a sheaf of betel. A man greets his superior with a sheaf of betel — a sheaf of betel is forty betel leaves folded along the mid rib. The bride greets her suitor with a sheaf of betel. Betel has been with our people for a very long time. The Mahawansa, the chronicle of ancient Sri Lankan history refers to an incident where poison is introduced into a chew of betel (bulath vita) sent to the King Mahanama. The fact that betel chewing was common in all strata of Sri Lankan society is apparent when we look at the implements used by betel chewers. In every home, rich or poor, the betel tray is indispensable. In the poorest home the betel is arranged in a vattiya (a small reed tray.) Middle class homes and temples had brass betel trays with a six or nine inch stand. The rich homes had tall brass stands with carved designs. The nut cracker or ‘giraya' used to slice the areca was an iron scissor-like implement turned out at the local smithy. In rich homes the nut cracker was made of brass, and very often the head of the nut cracker was cleverly carved to resemble the head of a crocodile or garden lizard. The poor man's chunnam was carried, folded in a betel leaf while the rich had brass or silver receptacles –kiolotes- carved with intricate designs. Thus there is ample testimony for the popularity of betel chewing. Why is betel considered sacred? Is it only because of legend? Dr. Upali Pilapitiya, former Director of the Institute of Ayurvedic Research in his genial and knowledgeable manner, put it this way. "The betel is a very useful plant. It cures many ailments. Perhaps people hold it sacred because of its many healing qualities. It is a cure for diseases of the mouth. It cures bad breath. It prevents plaque formation on teeth and keeps gums healthy. Betel also sharpens the appetite and helps digestion. That is why betel or ‘deheth' is offered to monks soon after the noon meal. Betel juice is used as a vehicle in most ayurvedic preparations. Pills or Gull for stomach ailments and worm infestations are dissolved in betel juice." The doctor's statement reminded me of an incident in my childhood. My cousin had a head full of lice. My aunt dissolved a tiny ball of mercury in betel juice, dipped a thick thread in the juice and tied round my cousin's head at bed time. The next day when she woke up there wasn't a single louse in her hair. Magic? The power of betel leaf of ‘kema' as my aunt put it. "Why do doctors of western medicine discourage betel chewing saying that it causes cancer" I asked Dr. Upali. "Anything however good can be turned harmful" he said. "The man in the street, village rather, chews betel and keeps the cud in his cheek until he gets hold of another chew. This cud with its extra chunnam and tobacco will eat into the soft flesh of the cheek and gums. It is not the fault of the chew but the chewer" he said. Just as I was going to put my pen down, I heard Darshani from next door talking of bulath padhaya. I pricked up my ears. Could it have something to do with betel? The bulath padhaya is one of the seven puja dances in the Kohomba Kankariya. The Kohomba Kankariya is a healing ritualistic dance. This was first performed for King Panduwasudev to exorcise a dividosa. The dividosa was a frightening and recurring nightmare which made the king incurably ill. The King of Malaya came to his friend's rescue and performed the Kohomba Kankariya. The bulath padhaya in recognition of the antiseptic and healing powers of betel is used here to invoke and greet the Gods. Here we see a fine fusion of the idea of welcome and of healing, enshrined in the betel leaf. This article first appeared in Explore Sri Lanka Magazine of July 2000.